Each lane player throws the ball against the backboard to start the drill. 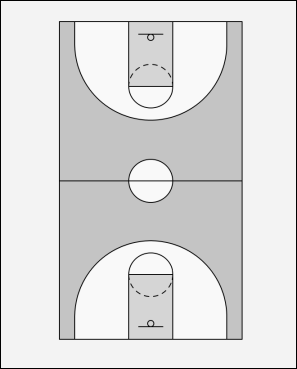 Both lane players throw the ball against the backboard, rebounds the shot and throw the ball to the outlet player who comes up to get the ball and yells outlet. Each lane player runs toward center court, once they cross center court, turn to look for a pass from the outlet players. The outlet players make the pass to the streaking players. This pass should be up as if over an imaginary defensive player as well as out of in front of the lane players. Once correct pass is completed, the outlet players chase the streaking players in an attempt to catch-up and play defense. The offensive player then takes the ball to the basket. As the player takes the ball to the basket, They MUST look back to read the defensive player's position. If the Defense is trailing without a chance to catch up, the offensive player takes a quick layup. If the defense is within 6 ft, the offensive player dribbles to cut off the defensive player, essentially sealing them off from making a block and shoots a layup. If the defense is even or slightly ahead, the offensive player executes a jump stop and either a spin move shot to the middle OR a head fake, quick backboard shot OR pulls up for a shot off the dribble. The defensive player rebounds the shot and pass to the outlet player to start the drill again. The offensive player goes to the end of the outlet player line.